I am currently traveling in Massachusetts, USA. One of my goals is to ensure I haven't double-tapped the card. You can see these details on the mbta website. Be careful on this page. The website is antiquated and unforgiving. If you click on any of the links on the left sidebar that navigate to URLs prefixed with www.mbta instead of charliecard and then click back to the original page, it will redirect you back to the page you clicked on by mistake. Not the answer you're looking for? Browse other questions tagged public-transport tickets boston or ask your own question. How to find out the remaining value on a Charlie Ticket? Where can I obtain a SUBE card for the Buenos Aires Subte and Bus systems? Where can I store my bag in Boston for an hour or two? 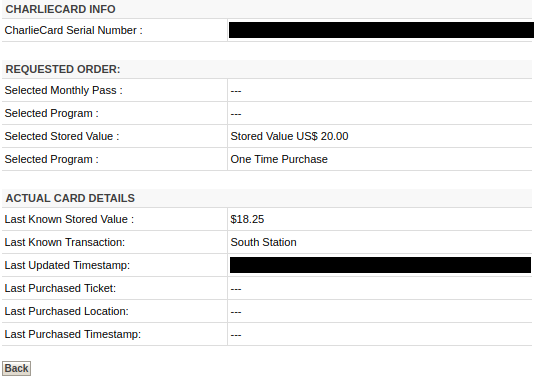 Can I transfer the value stored in my CharlieTicket into a CharlieCard? How or where can I buy a MOBIB Basic card?